In 'revenge' on Kurds who took back border town, ISIS commits one of its 'worst massacres' in Syria targeting civilians. At least 120 civilians have been killed by the Islamic State (ISIS) group since it entered the Syrian Kurdish town of Kobane just over 24 hours ago, a monitoring group said Friday. "According to medical sources and Kobane residents, 120 civilians were executed by ISIS in their homes or killed by the group's rockets or snipers," said Rami Abdel Rahman, director of the Syrian Observatory for Human Rights. He described it as one of the group's "worst massacres" in Syria. Another 26 civilians were executed by ISIS on Thursday in a village near Kobane, on the border with Turkey, the Observatory said. "When they entered the town, the jihadists took up positions in buildings at the southeast and southwest entrances, firing at everything that moved," Abdel Rahman said. He said the bodies of civilians, among them women and children, were found in their homes and in the streets. "The jihadists knew that they could not stay and control the town in the face of the Kurdish forces. They came just to kill and strike a moral blow to the Kurds," Abdel Rahman said. 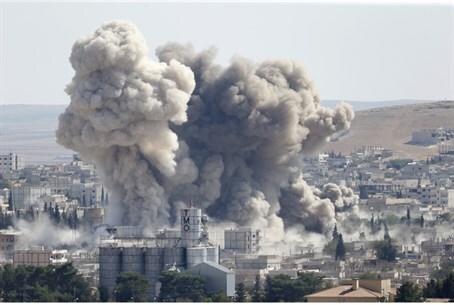 Kurdish activist Arin Shekhmos said: "Every family in Kobane lost a family member on Thursday." ISIS launched a surprise attack on Kobane on Thursday involving three suicide bombers, just over a week after Kurdish militia ousted it from Tal Abyad, another border town further east. Analysts said the assault was revenge for the loss of Tal Abyad. Backed by US air strikes and Syrian rebel groups, Kurdish militia had pushed ISIS out of Kobane in January in one of the jihadists' most dramatic defeats.